liIt is an amazing experience to find true love. Love is universal and relatable. It crosses cultural lines, language barriers and knows no boundaries. But as wonderful as love is, it can still be difficult to express these emotions in unique and creative ways. Words can be just as powerful as love, however, we often fall short of relating our feelings without running into clichés and corny sayings. Your love is more valuable than gold, more precious than the rarest ruby. 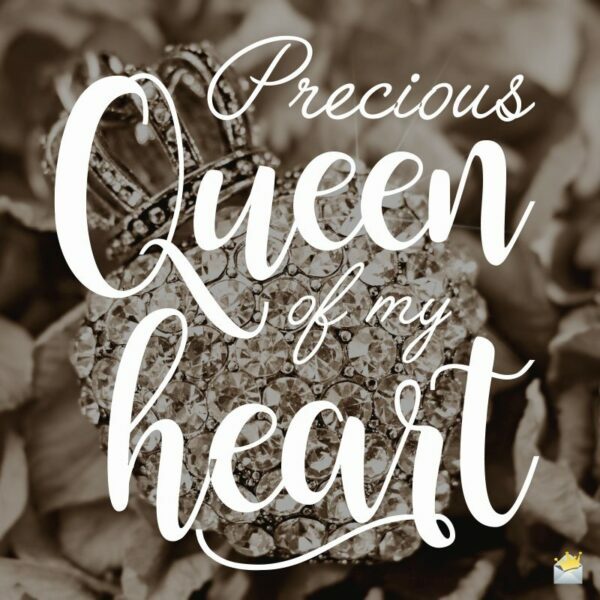 You are the greatest treasure. My greatest motivation in life is to love you as though I will never see you again and to cherish every moment with you. One second with you is better than a million elsewhere. You hold the key to my heart in your soft, little hands; the light of my life sparkles in your eyes. You are truly the love that I have been searching for all my life, even when I didn’t know I was searching. You are the women I have waited for, even when I didn’t know I was waiting. You truly complete me. Kisses from your lips warm my soul. The touch of your hand melts my heart. Your love is the greatest gain that I hope to never lose. I could search for eternity and never find another woman like you. You are loud, obnoxious, and sarcastic…I wouldn’t have it any other way. Sometimes you make me wish we’d never met, but then I wouldn’t have become the man I am today. You are beautiful even when you’re mad. That’s why I love to drive you crazy. I can never get you out of my mind, so I figured I’d let you stay there. You little thief. You stole my heart. Your punishment is that you’re never allowed to give it back. I have a lot of love to give and not enough time. So let’s make this moment last. Darling, say you’ll be mine. You make me blush like a teenage crush and smile like a fool in love. There will never be another you or another me. So let’s get together and make history. We are like planets. Even when we are far apart, our love is the gravity that keeps us together. I haven’t known you for a long time, but I have a feeling that this love will last forever. I hope we grow old together and never forget the feeling we felt when we first fell in love. I truly feel there is a reason we have met and that reason is to hold onto each other and never let go. My heart is leading me to you. Every moment we share together, I know a little more about you. The more I discover about you, the deeper I fall in love with you. You are the most beautiful woman I know, but that is not why I fell in love with you. You have the most beautiful mind and most caring heart and that is why I will never let you go. I love you because you love me, not only for the man I am today, but for the man that you believe I have the potential to become. 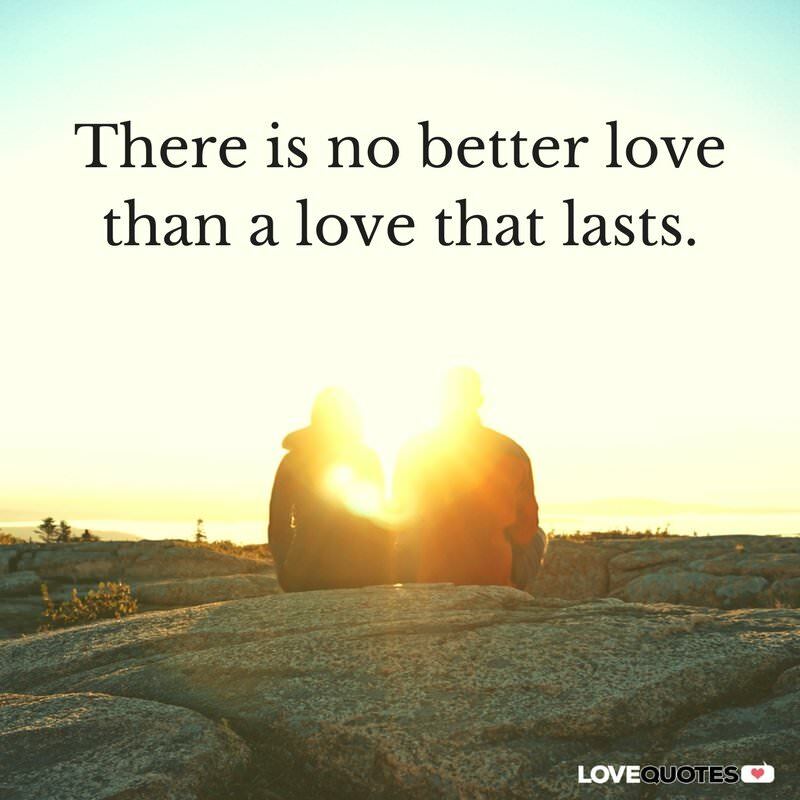 There is no better love than a love that lasts. They say that new flames burn brighter, but old flames burn longer. I cherish every day we’ve spent together, even the bad ones. You have brought so much joy to my life. I love a lot of things about you: the way you smile, the way you laugh, and the simple way you are always right about everything. You must truly be the one, because you have stayed by my side all these years and you never give up on me. I have loved you since our first “Hello”. I pray every night that we will never have to say “Goodbye”. The best moments in my life are the ones that I have spent with you. The hope that we have is to grow with each other, learn from each other and never give up on the love we have for each other. We may be young, but the best thing about our love is that we have a life time to look forward too. We are only young for a moment, so let’s spend it together making every moment count. I don’t know where I’ll be when I’m old, but I hope your hand will still be in mine. Time has been kind to us. It has flown by with such speed but slows down just enough to let every special moment that I’ve spent with you become engraved in my memory. This is what I will hold onto forever until death do us part. You have aged more gracefully and beautifully that I have ever witnessed. Since the first day I’ve laid eyes on you, you still get more beautiful every day. Through all the ups and downs; through the good days and bad days; through my failures and successes; gains and losses; one thing has remained constant: You are always there; you love faithfully. You have been my best friend through all these years. You know me better than I know myself and that makes me love you so much more. We may be old in age, but we are young in love. You are my last love and that is special because you made me forget my first love. Every time our lips meet, I am automatically transported to heaven. I can’t thank my lucky stars enough for blessing me with a wonderful wife like you. I smile every day because I know that in good times and bad times your love will always be with me. If that’s not true love, then there is no such thing as true love. I love you immensely, my dearest wife. I shine and smile every day because I have the love of the most beautiful woman on earth. I’m so grateful to God that He made you a part of me. I never knew that life on earth could be this beautiful until you decided to be a part and parcel of my life. Thank you for giving me a love more colorful than multiple rainbows. There is no room or sadness in my heart because your amazing love has filled it up with happiness. Thank you for loving me this much, darling. Honey, I wouldn’t cry if I were to lose you; I would literally die because you are not only my loving wife but also everything I live for in this world. Dearest wife, since God gifted you to me, every day of my life has been as lovely as a sunny day in heaven. 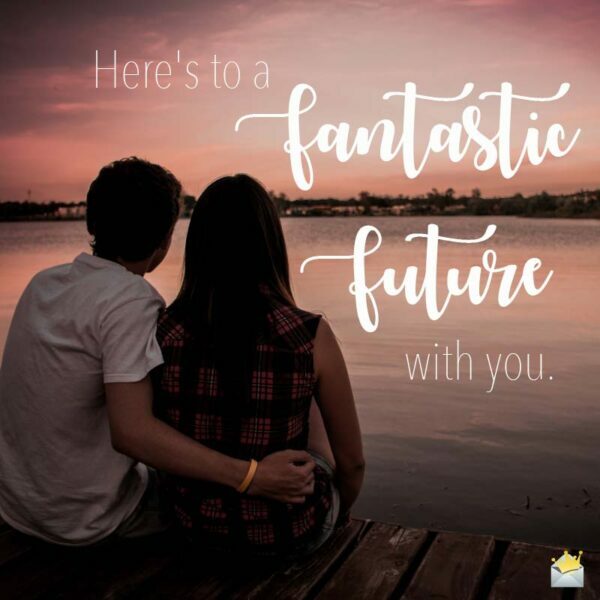 Here’s to a Fantastic Future with you. Sweetheart, I trust in your love just as much as I trust in God. That is how extraordinary your love is to me. If my heart were a tribe, you’d certainly be its chief. I promise to never let you down because your love never lets me down. Not even God’s love has the power to cast a spell over me like your love does. Sweetheart, I promise from the bottom of my heart to be there for you until my time on earth is up. Dear wife, I can’t stop boasting of you every blessed day because you are the jewel of my life. Your love brings me a kind of happiness that I have never felt my entire life. There’s nothing in this universe that I wouldn’t do to fill your life with the extraordinary happiness that you bring into my life. Sweet darling, every day I am saved by your love because it is the air I breathe, the food I eat, and the water I drink. I can survive on this earth longer without air than I can without your love. May God forever strengthen this divine bond we have between us. The search for the love of my life ended the very moment I saw you, babe. It’s amazing how despite the fact that you are not God, you bless me with absolute happiness every time you come around. I was a weak man until you came into my life and turned me into the strongest man on earth. I will never stop loving you until the day the rivers stop carrying salt to the ocean. I have never been as happy as I feel today simply because I have a wonderful person like you with me night and day. I love you so much. Not even a planet full of diamonds can shine brighter than you, my love. I still don’t understand how I got so lucky and blessed to be with someone as wonderful as you in this lifetime. God created the world in six days and on the seventh day He made a wonderful girl like you to bring me paradise on earth. 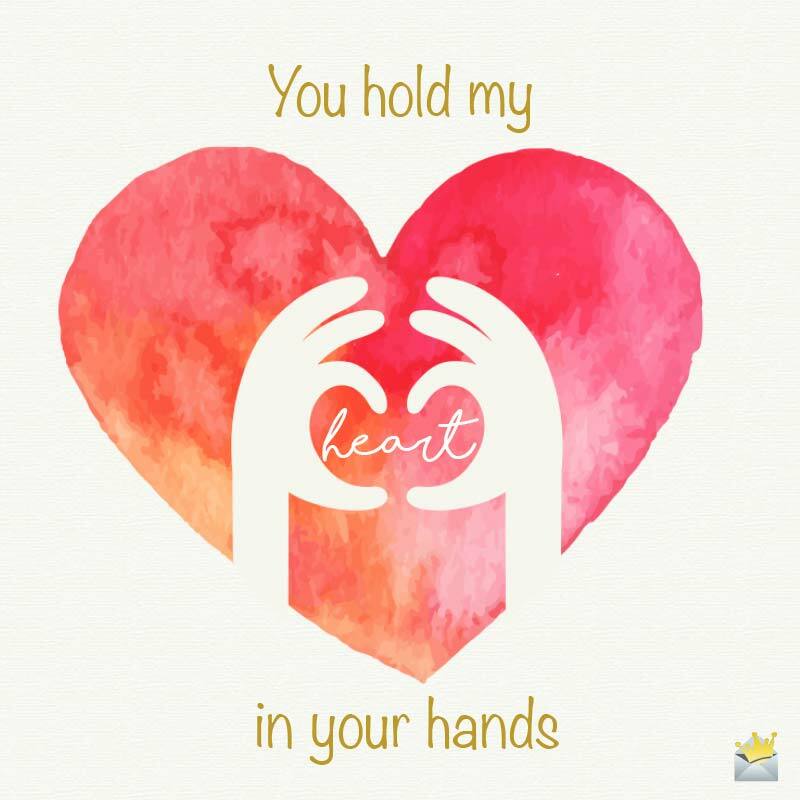 You hold my heart in your hands. A toast to the most beautiful girl/woman on earth. I love you like God loves His children. No words in any country in the world are strong enough to show you how much you mean to me. I love you endlessly, my darling. There’s nothing in my life that is even half as precious as the love you give to me. May we forever find happiness and serenity in each other’s arms. My heart shall forever overflow with joy so far as my lips are the only lips you kiss. I love you from the top most part of your head all the way to the bottom of your toes. You make every ugly thing in my life as beautiful as paradise. I thank you very much for bringing me all the happiness that exists on planet Earth. I thought God was the only one that gave happiness, but sweetheart, you have proved me wrong. Sweetheart, you are not only beautiful on the outside but also beautiful where it matters most – in the inside. Not even the language of angels is powerful enough to express how much I love and cherish you. You have blessed me with the happiest heart in the world just by being in my life and loving me in return. That’s the most beautiful gift of my life. I was not born a star, but you came into my life with your amazing love and turned me into one. Honey, nothing will ever tear us asunder because our love for each other is as solid as a rock. I might be always tight on funds but you always make me feel like the richest man on earth, and for that, I don’t mind walking to the end of the world just to put a smile on that beautiful face of yours. Your love is the most beautiful gift God could ever give me. Every day is my best day ever because I have you in my world. Our souls were intertwined long before we came into this world, and that is why I can lose everything in my life and still be a happy man if you are with me. From the very first time I saw you, I wanted to be a part of your life wholeheartedly. Today, I’m so happy because that dream has come true. I love you so much. Every day I live because I have you in my life. The importance of your love in my life can never be overstated. I could look in your eyes for a billion years and never get tired of doing that. Such is the extraordinary power of your beauty, my love. It feels so good to be me because God has bestowed upon me the love of the most amazing woman He ever created. Honey, I’m so glad that I saved all my love for no one but you. I don’t dream of anyone except you because your love is my life. There is absolutely nothing in any part of this universe as incredible as your love!